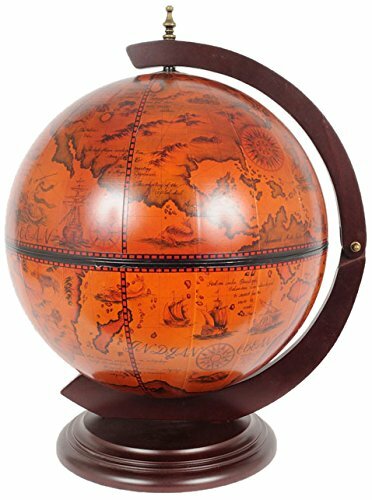 These vintage-style old world globes with hidden mini bars inside are unique classics and promise to house your wine or liquor while contributing handsomely to your space's decor. The rich, sophisticated look of these unique, wooden mini bar globes is warm and inviting at day's end. And whether you're a wine or liquor connoisseur--decorator or not-- these great-looking bar cabinets with wheels literally keep the spirit of the night in motion for a great evening. And the conundrum of where to hide . . . er . 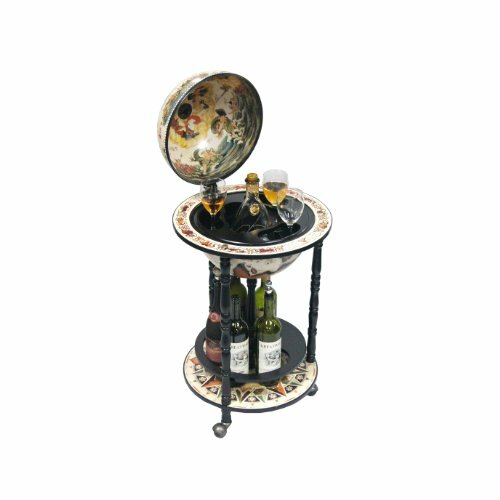 . . house your most-prized wines, and liquors in a stately cabinet with arm's-reach availability-- and beauty is satisfied in an instant with these Old World style floor mini bars. Scroll down to peruse the many globe-style wooden mini bar cabinets featured here based on great reviews, price and quality. 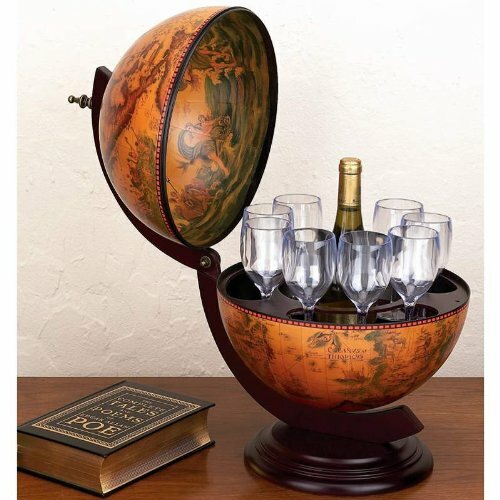 A globe with mini bar inside~Who knew? Image credit: Amazon.com. 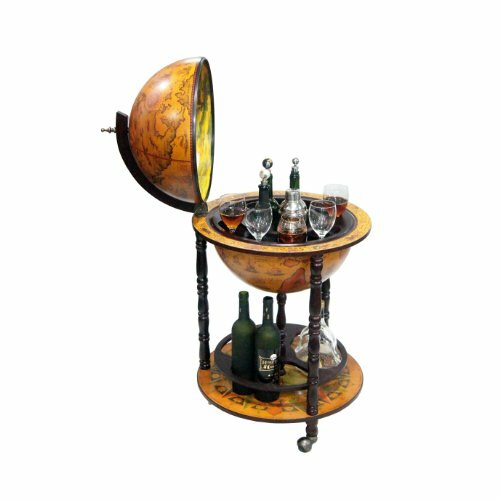 Antique finished wooden Old World globe liquor cabinet shown here is available below. tabletop, desk, floor or corner globe mini bar? As you'll see (like I have), these globe mini bars have a range of sizes while preserving the same, Old World style. I suggest taking inventory of your wine or liquors and accompanying glass and stemware after deciding where you'll place the bar. Ideally, the bar should look snug in its corner, or whatever area you plant it without the mini bar looking too big or puny and undervalued. And these globes make great dividers between living and dining spaces or home office. One good thing I've noted, is these small and medium bar cabinets look great situated beside a weighty, overstuffed chair, much like an end table would. And the wheels make easy work of moving the globe mini bar from here to there. You may even want to experiment before making your purchase decision by using an unrelated piece you already have on hand, one that's similar in size and shape as your proposed bar cabinet. It really works in giving you an idea of placement, size, etc. before 'cementing the deal' on the bar. 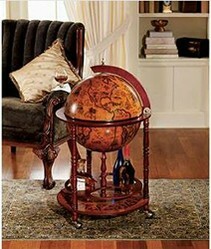 These well-made world map liquor cabinet globes are mostly crafted from wood, hardwood legs and lovely brass accents. Their convenient metal rolling casters add to the globe bars' portability, literally delivering spirits to you and your guests. Old world charm, lifted spirits and the company of close friends. Gotta love it. I sure do. There's a ton of Old World Nautical charm with this corner globe liquor cabinet bar. With its rich hues, it promises to be a favorite piece in your room's decor. And done up in oceanic theme, the vintage maps feature images of oceans and ships of bygone 16th century nautical maps made to look weathered and highlighted with an antique-like finish. 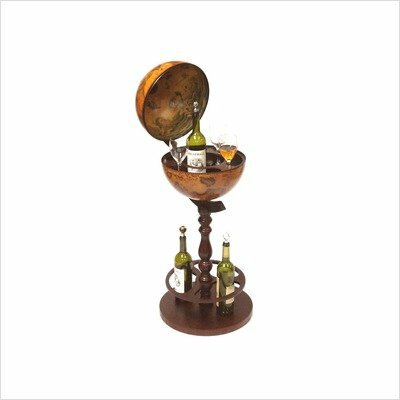 The hinged globe opens to reveal your own hidden treasure liquor, wine and other spirits. Too, the mini bar's casters (wheels) lend to its portability, so its sure to be a fave at your next celebration. But for now, relax while you sip your night cap and appreciate the amber-glow good looks of this rare treat [insert your own visual, here]. enjoying wine and spirits is an art form . . .
For entertainers like me, this Old World Globe trolley mini bar has plenty to offer for its 32" L x 20"W 36" H size: Large, rotating bar area to keep liquor or wine chilled for quite a while as the counter-like area serves up hors d'oeuvres aplenty. There's plenty of room at the bottom of the globe's cart for wine bottles, accoutrements, tumblers and stemware. The cart's portability make this mini bar a big plus for serving, as well as a decorative accent that'll look great as a decorative element when the bar is not in use. Enjoying wine and spirits is an art form in itself and this bar's inspiring 16th century artwork adds to the experience. What size globe liquor bar are you looking for? Obviously, smaller spaces require more thought and planning, with form and function being critical to appointing your home with attractive pieces with purpose, like these small globe bars. 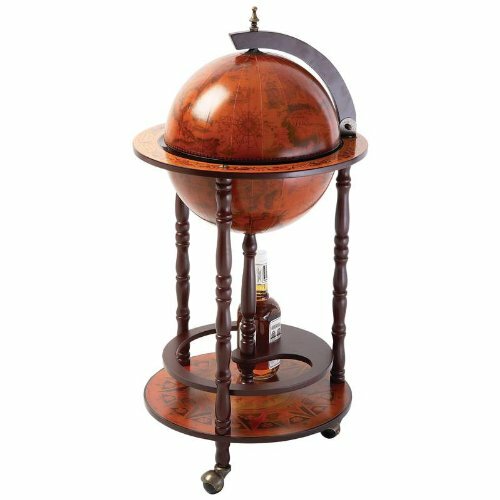 The practical and very useful liquor cabinet mini bar is hidden away while the attractive old world globe exterior serve to awe admirers. Indeed, these mini bar cabinets are the ideal storage solution for your loft apartment, home office or smaller space. 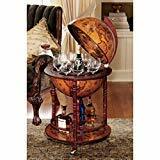 With this table or desk top globe liquor cabinet, you'll have all the perks and space inside as a floor mini bar but a compact size that will look fabulous in your home office, loft apartment or anywhere you find space that's needs an attractive element. There's room enough in the globe for several wine stems and a wine or liquor bottle tidily secreted inside. The beauty of a floor model-- attractive all the way around but a tidy mini bar costing far less. 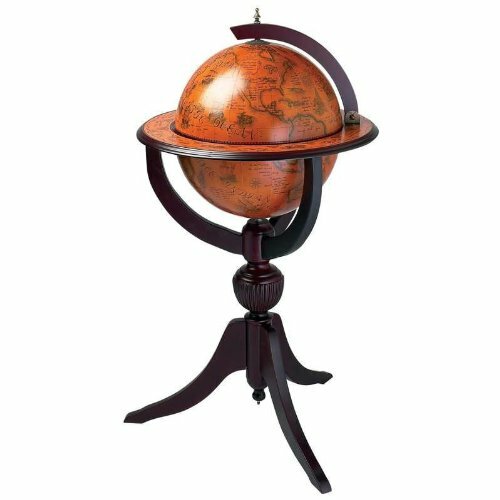 It's important to note that globe bars differ in price and can be very expensive for hand painted map exteriors and Renaissance period replica interiors. These more budget-conscience globe mini bars have the look of those pricier liquor and wine cabinets. The antique appearance of these pieces is achieved via detailed replicas of famous or nondescript period works of art that are applied to the globe's surface. As always, prices are relative to each bar's quality. Some globe bar cabinets have decals and aren't yet applied to the globe. Be sure to ask if you're not sure. 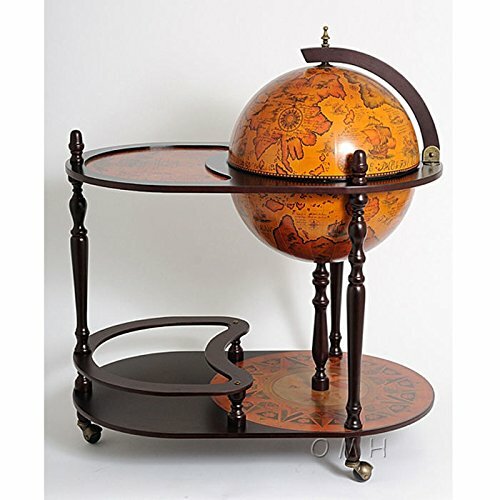 This stunning Italian globe bar is highly rated for its fine finish and good construct. It's sizable at 44" high and is sure to accommodate all your favorite spirits and wines. This mini bar features nautical map replicas done in 16th century design. 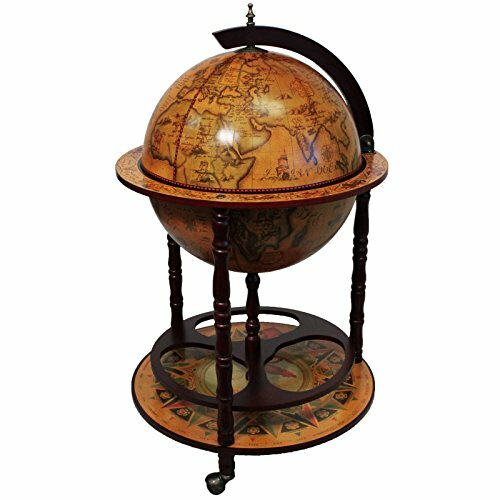 Lovely wooden stand is hand painted and the attention to detail makes this globe bar a great decorative piece in your favorite room. Be sure to place your new bar in a prominent corner to create an ideal focal point. There's few things more obnoxious and a threat to your decor than an oversized piece of furniture or accessory in a small space. It's here your mistake can take the air out of a room, smothering your other pieces. For smaller rooms, this globe mini bar on a single post wood stand will serve you well as decorative corner piece with purpose. I remember the first time I saw these low-priced globes that hold liquor; I was intrigued. Living in an apartment meant floor space was at a premium and everything I added to it had to be both decorative and useful--multi-purpose to the nth degree. So, when I attended a party at a fellow apartment dweller's place and happened upon a globe mini bar I was impressed with the amount of liquor inside--not to mention its attractive Old World style exterior. But times 'back then' were much different and it wasn't like I could go to my computer and order one from Amazon; so, my wish for a globe mini bar had to remain just that. A wish. Fast forward and I've long since moved from that apartment and had more room for a standing bar but my love for these uber-classic mini bar cabinets hasn't wavered; hence my writing about them, now. I do hope if you live in an apartment or condo, these globe bars with the surprise of smooth-spirited liquors inside will be a part of your decor. And I'm willing to bet you won't regret it. 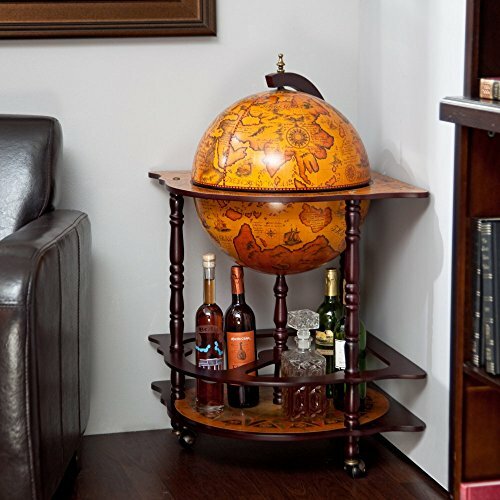 What mini bar globe liquor cabinet is your fave? Loved the mini bar globe designs. They are all fabulous. Table and Desk lamps like these, with an extra power outlet and/or USB charger in its base, add even more utility as a fun-to-formal lighting solution.